Mount Sinai Jewish Center is a vibrant Modern Orthodox synagogue with a rich history spanning more than 100 years in Washington Heights. It is the center of a cohesive and inclusive community which maintains traditional halachic observance while engaging the next generation of Jewish leaders. We serve a diverse and multi-generational community through an array of religious, social, and educational services and programs. In addition to meaningful daily, Shabbat, and Holiday tefillot, we offer stimulating shiurim on a wide variety to topics, frequent scholars-in-residence, peer-led and individual learning opportunities in our Beit Midrash; a variety of social programs for young professionals, recent college graduates, seniors, married couples, and families; and volunteer opportunities which benefit the broader Washington Heights Jewish community. Check out our helpful Information Booklet about Mount Sinai Jewish Center and resources in the Washington Heights neighborhood! 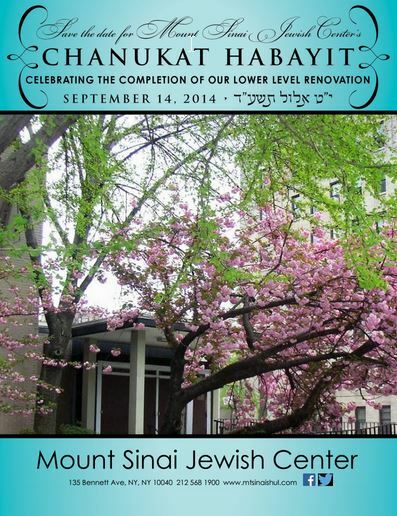 Like the Mount Sinai Jewish Center Fan Page and Join our Facebook Group!